a) He of good vows - to protect anyone who surrenders.b) He who did intense tapas in His nara-nArAyaNa incarnation.c) He who has good control of the offerings He accepts - e.g., from the likes of kucela only.d) He who observes nitya-karma-s in His incarnations just to set an example to us.om su-vrtAya namah.This nAma occurs later as nAma 824.Under nAma 824 SrI BhaTTar gives the vyAkhyAnam that is most familiar to allof us - Lord rAma's vrata expressed during vibhIshNa SaraNAgati through sakRdeva prapannAya tavAsmIti ca yAcate | abhayam sarva-bhUtebhyo dadAmyetat vratam mama || yuddha18.34 "To him who seeks my protection even once and begs of mesaying "I am Thine", to him I give protection from all beings. This is myvow". 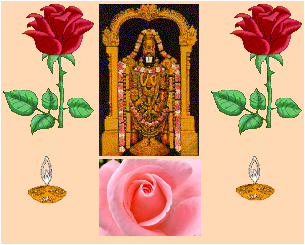 SrI v.v.rAmAnujan gives the equivalent reference fromnammAzhvAr's SrIsUkti - SaraNamAgum tanatAL aDaindArgatkellAm - tiruvAimozhi9.10.5. SrI Sa~nkara gives this interpretation under the currentnAma, but gives a different anubhavam for the nAma when it occurs later inSlokam 88. There he interprets vratayati as enjoys, and su-vrata asreferring to His enjoying the offerings of bhakta-s such as kucela. vratamis control of the food one eats and other controls. SrI rAdhAkRshNa Sastriobserves that bhagavAn had good control of His habits when He wasnara-nArAyaNa. SrI cinmayAnanda gives another dimension of thenara-nArAyaNa incarnation as its applies to the nAmna su-vrata - He who didintense tapas (su-vrata) for a long number of years in the nara-nArAyaNamount in BadrinAth.For the current nAma, SrI BhaTTar gives another aspect of bhgavAn's su-vrata- good deeds. BhagavAn has nothing to gain by observance of any karma suchas the prescribed kula dharma-s. Even so, bhagavAn observes all theanushTAna-s during His incarnations without any compromise. Thus He is asu-vrata. He says in the gItA - na me pArtha asti kartavyam trishu lokeshu ki~ncana | na anavAptam avAptavyam varta eva ca karmaNi || 3.22 "For me, arjuna! There is nothing in all the three worlds whichought to be done, nor is anything that is not acquired that ought to beacquired. Yet I go on working".BhagavAn continues to work purely for the benefit of His creation. This isthe significance of His nAma as su-vrata. He says in the very next Sloka inthe gItA that if He did not do this, He will set a bad example for others,and they will not perform their prescribed duties and suffer for this lapse.The dharma cakram writer gives some examples of the power of su-vrata.BhIshma practised the su-vrata of brahmacarya, which gave him his enormousgreatness. hariScandra's story is an example of the greatness ofsatya-vrata.The nAma-s from 457 to 463 that follow are interpreted by SrI BhaTTar firstbased on the nara-nArAyaNa incarnation, and then he gives an alternateinterpretation based on the mohini incarnation. He with a charming face.om su-mukhAya namah.su - Sobhanam mukham asya iti su-mukhah.This can be taken as a reference to His having a sweet countenance even whenHe was chanting the mantra-s and meditating as nArAyaNa maharshi in Hisnara-nArAyaNa incarnation. SrI BhaTTar refers us to the mantra aboutkRshNa - kRshNAya kamala-dala amala netrAya - To SrI kRshNa Who has aface with eyes pure and spotless like a lotus petal. SrI v.v.rAmAnujangives reference to nAcciyAr tirumozhi - "engaLai maiyal ERRi mayakka unmugam mAya-mandiram tAn kolO" 2.4; amalanAdipirAn - ap-perivAya kaNgaLennaip-pEdaimai SeidanavE - 8; prasanna vadanam dhyAyet etc.SrI rAdhAkRshNa Sastri explains the significance of the nAma very nicely bypointing out that normally with practice one overcomes the strain of severepenance, and so the countenance will not reflect any strain. But inbhagavAn's case we see cheerfulness instead of just the lack of strain. WhenHe was told to go to the forest just at the time He was decorated forpaTTAbhishekam,His face didn't have the slightest indication of disappointment or sadness,but instead displayed the peace and satisfaction typical of the greatest ofthose who have renounced the worldly things (ayodhyA kANDa 19.30-33).kamban's description of rAma's face is "meit-tiruppadam mEvu enRa pOdilum,it-tirut-tuRandu Egu enRa pOdilum, cittirattil alarnda Sen-tAmaraiyaiottirukkum mugattinai unnuvAL" - Lord rAma's face resembled apicture-perfect lotus-flower no matter whether He was asked to ascend thethrone or to forsake all and go to the forest.SrI Sa~nkara gives reference to vishNu purANam and to several passages fromSrImad rAmAyaNa. In vishNu purANam we have - prasanna vadanam cArupadma-patrAyatekshaNam (6.7.79)- His face is pleasing, handsome, possessedof large eyes resembling the lotus-petal. In rAmAyaNa, SrI Sa~nkara givesreferences to sundara kAndam 33.24 - sa pitur-vacanam SrImAn abhishekAtparam priyam | manasA pUrvam AsAdya vAcA prati-gRhItavAn; ayodhyA kANDam24.17 - imAni tu mahAraNye vihRtya nava-pa~nca ca | varshANiprama-prItah sthAsyAmi vacanam tava ||; and ayodhyA kANDam 19.33 - na vanamgantu-kAmasya tyajataSca vasundarAm | sarva-lokAtigasyeva mano rAmasyavivyate ||An alternate interpretation given by SrI Sa~nkara based on the Sruti passage- yo brahmANam vidadhAti pUrvam - SvetA. upa. 6.18, is that He has a verysatisfied countenance because He has imparted all the knowledge to brahmA. Subtle, delicate and difficult to comprehend.om sUkhsmAya namah.He is sUkshmah because He can be realized only by deep contemplation andmeditation which is performed without expecting any benefit. He can't becomprehended through the physical organs such as the eyes and ears, andcan't be realized through the mind, but can only be experienced.SrI rAdhAkRshNa Sastri nicely explains the power behind the concept ofsUkshma. The subtler the object, the more power it has. We all know theultimate power of the atom. If we start from the macro level of our body,and go through the different subtler levels such as the sense-organs, themind, the buddhi, and finally the soul, the power increases as the subtletyincreases. MahAvishNu is subtler than the subtlest of things, sUkshmah.SrI Sa~nkara gives reference to the Sruti - sarva-gatam susUkshmam -muNDakopanishad 1.1.6 - He who is very subtle and has entered intoeverything.SrI cinmayAnanda points out that in vedAnta terminology, sUkshma or subtletyimplies pervasiveness, and bhagavAn's nAma of sUkshma refers to HisAll-pervasiveness.SrI satyadevo vAsishTha gives a different perspective to the anubhavam ofthis nAma by tracing the nAma to the root sUc - paiSunye - to point out, toindicate by gesture. He gives the explanation thatbhagavAn is suKshmah because, even though He does not manifest Himselfexpressly, He expresses Himself to us through everything around us all thetime. This is the sUkshma behind vishNu the Sukshmah, viz. that He is allaround us and has never really hidden Himself from us in any way.Just as the sound made by the cow identifies the cow even if the cow is notseen, or the sound (voice) created by a person identifies the person eventhough the person is not seen, so also everything around us that is createdby bhagavAn identifies Him to us (e.g., the AkASa, the sound from the AkASa,etc). a) He whose voice is itself the great veda-s.b) He who is praised by the delightful voice of the veda-s.c) He who has a very sweet, deep, and sonorous voice.om su-ghoshAya namah.SrI BhaTTar vyAkhyAnam is that bhagavAn is su-ghoshah because He isproclaimed by the vedic voice of the upanishads. bhagavAn is veda-svarUpiHimself. SrI v.v.rAmAnujan refers us to tiruvAimozhi - nAraNan, muzhuEzhulagukkum nAthan, vEda mayan (2.7.2), and to peria tirumozhi 5.5.9, wheretiruma~ngai AzhvAr called bhagavAn "SandOgan, pauzhiyan, ain-tazhal Ombutaittiriyan, Sama-vedI". SrI Sa~nkara bhAshyam is "su-Sobhano ghoshovedAtmako asya iti su-ghoshah" - One whose auspicious sound is the veda-s.He also gives a more direct alternate interpretation - He who has a voicedeep and sonorous like that of the cloud - megha-gambhIra ghoshatvAt.The dharma cakram writer points out that when veda is chanted with theproper intonations, the sound originates from the region of the diaphragm,and this sound has the ability to cleanse and purify our mind. The sweetsound of Nature, the sound arising from the trees and the birds, is soothingand comforting to the mind. BhAratiyAr sings "kETkum oliyil ellAm nandalAlAundan gItam iSaikkudaDA nandalAlA". All the musical instruments werediscovered as a result of listening to the sweet sound of Nature. This nAmashould remind us that all the mantra-s sung in praise of bhagavAn and thatsing His greatness are su-ghosha-s.SrI satyadevo vAsishsTha looks at the nAma from its root - hushir viSabdane- to proclaim, to declare. The nAma su-ghoshah is formed by prefixing theupasarga su- which means "Sobhana". su-ghoshah is thus the sound whichproclaims Him well repeatedly or loudly viz. the veda-s. Since the name andthe One who is referred to by that name are same, He becomes su-ghoshah.BhagavAn manaifests Himself through su-ghoshah in real life constantlyeverywhere. The knowledge of the rain, that of the running water as well aswater that is obstructed from its natural flow, all these can be known fromthe sound emanating from these. Just as a great artist is revealed by theart he/she creates, bhagavAn is constantly revealed through the sweet soundsof Nature that He has created. He who Bestows Bliss.om sukha-dAya namah.BhagavAn bestows Supreme Bliss on those who practice sadAcAra (good conduct)and deep meditation (samAdhi). SrI BhaTTar's vyAkhyAnam is - sadAcArasamAdhi anushThApanena tan-nishThebhyah phalam parama-sukham dadAti itisukha-dah. SrI v.v.rAmAnujan observes that bhagavAn just does not stop withgiving the fruits to those who observe sadAcAra, but He Himself observesthese anushTHAna-s to set an example to us so that we can follow His pathand get the parama-sukham. This is revealed by Lord kRshNa in the gItA inSlokam 3.23 which we referred to earlier under nAma 456. SrI rAmAnujanrefers us to nammAazhvAr - "inbam payakka iniduDan vIRRirundu iv-ezhulagaiAlginRa e~ngaL pirAn - tiruvAimozhi 7.10.1.The dharma cakram writer points out that even though bhagavAn is the One whobestows even the ordinary benefits such as wealth, health etc., based onkarma-s, the significance of the current nAma is that He alone can bestowthe Ultimate sukham viz. moksham.SrI Sa~nkara gives an additional interpretation which means that bhagavAndestroys the sukham of those who are wicked and evil. asad-vRttAnAm sukhamdyati khaNDayati iti vA sukhadah.SrI satyadevo vAsishTha analyzes the word into three part su, kha, and da,and gives an interpretation different from the above. He starts with khanu- avadhAraNe - to dig, and equates su-kha with the SarIra with its outletsthat allow us to lead a life without sickness, disease etc. One who givesthis sukha sarIra is su-kha-dah - sukham khAtam tad-dah sukhadah vishNuh. The good-hearted, a True Friend.om su-hRde namah.BhagavAn is always on the lookout for ways to help even His adversaries, andthis is His Nature of being a su-hRt. SrI BhaTTar vyAkhyAnam is -anupakAriNi api "kim asya bhavishyati? kim karavANi" iti SubhASamsi SobhanahRdayatvam su-hRtvam. su-hRtvam or friendliness is that quality of abenevolent person who wishes good even for those who have not helped him inany way, and who, being apprehensive of any evil that may befall them,always thinks "How shall I help them? ".SrI v.v.rAmAnujan refers us to SrImad rAmAyaNam - ripUNAmapi vatsalah - Afriend even to His enemies.The dharma cakram writer observes that the heart which suffers when sorrowhits, or rejoices when a favorable event occurs, is not the "good heart"referred to here, but the heart that bleeds when others suffer is the goodheart. Lord rAma was not affected one way or the other when He was about tobe crowned or when He was asked to leave for exile in the forest. He wasneutral in both circumstances. But the pure heart is one which anguisheswhen someone else suffers, and rushes to help those who need help.Meditating on the significance of this nAma will lead to the purification ofthe heart of the devotee. He who captivates the heart.om mano-harAya namah.Because of the innate benevolence noted above, He captivates everyone'sheart. SrI v.v.rAmAnujan gives reference to nammAzhvAr - maiyal Seidu ennaimanam kavarndAnE - tiruvAimozhi 7.2.6. SrI cinmayAnanda has appropriatelytranslated this nAma as "One who is the looter of the mind". His vyAkhyAnamis "Not only is the Lord Beauty Incarnate, but He compels the attention ofthe devotee to come away from all other sense objects to dwell upon Hisenchanting form. Thus vishNu is one who generates an irresistible joy inthe mind of His devotees and compels them to spend their time in constantworship".SrI satyadevo vAsishTha points out that bhagavAn has created all things withthis mano-haratva attribute built into everything He created. Now we seeal these beautiful things around us, and our mind is captivated by thisingenuity of the Creator, and we wonder aloud - "Who could it be thatcreated this marvel?" So He is mano-harah.The dharma cakram writer generalizes the interpretation of this nAma tosuggest that bhagavAn gravitates the minds of people either towards Him ortowards the worldly objects depending on what they want. Those who wantmaterialistic pleasures, He gravitates their mind deeper towards the life ofshort-term enjoyment; and those who have controlled their mind and senses,He gravitates these devotees closer and closer towards Him. So bhagavAn ismano-harah for both categories of people. He who has overcome anger.om jita-krodhAya namah.Because BhagavAn has conquered all bad qualities including anger, He isjita-krodhah. He gets angry only if He chooses to get angry by His ownwill. SrI v.v.rAmAnujan gives the following reference: In the beginningof SrImad rAmAyaNa SrI vAlmIki asks the question "Who is the jita-krodhah"among people, and nArada responds that it is rAma - ucyamAno'pi parusham nauttaram pratipadyate - Even when others utter harsh words towards Him, Hedoes not respond with similar harsh words.SrI rAdhAkRshNa Sastri distinguishes between three types of anger, all ofwhich have been mastered by BhagavAn. manyu is the type of anger which isin the mind but which does not find expression in words or in action. Whenthe anger spills out in the form of reddening of the eyes, expression in theface, etc., this is called kopam. When anger finds expression in harshwords, shaking of the body, deeds which reflect harshness as a result of theanger, etc., then this is called krodham. It is to be noted that bhagavAnhas not eliminated anger completely, but just has conquered it, and will getangry when He feels the need for it. SrI vAlmIki nicely expresses thisthrough the words "krodham AhArayat tIvram" - 3.24.33 - He brought Himselfto be angry. When His devotee hanumAn is hurt by rAvaNa, Lord rAma madeHimself angry. (yuddha 59.147). SrI Sa~nkara points out that if He killsan asura, it is not because of anger but only to establish the vedic orderof life.SrI cinmayAnanda extends the anubhavam to include not just krodha, but allthe six types of afflictions that a man can suffer from - kAma, krodha,lobha, moha, mada, and mAtsarya. This nAma indicates that bhagavAn hasconquered all of these.SrI satyadevo vAsishTha, who in addition to his great mastery of samskRt,was a great ayurvedic expert as well as a great astrologer, comments thatkrodham is a result of some defects of the body, and is caused by animbalance in the bodily juices. Since bhagavAn is not subject to thesedeficiencies, He is not subject to kAma, krodha etc.The interpretations by SrI BhaTTar for nAma-s 457 to 463 that were given sofar were based on bhagavAn's nara-nArAyaNa incarnation. He has also givena set of alternate interpretations for these nAma-s based on the mohiniincarnation, which are covered below. 457. su-mukhahHe who has a charming face - He who shines with a facewhich is delightful like the moon and which is replete with the nectar ofBliss very much like the pot of nectar held in the hand.458. sUkshmah - The Subtle - He is subtle because His thoughts were hiddenfrom the asura-s.459. su-ghoshah - He who is the object of loud and delectable praise - Hisact of churning was delectable and was praised loudly both by the gods andthe asura-s.460. sukha-dah - The Giver of Joy - He gives joy to the gods by distributingthe nectar to them.461. su-hRt - The friend - because of His love for the deva-s.462. mano-harah - The heart-ravishing - His form bewitched the minds of theasura-s.463. jita-krodhah - He who conquered the anger - On seeing His form theminds of the asura-s became confounded with confusion and thereby Heovercame the anger of the asura-s against the gods.nAma-s 464 to 470 which follow are also interpreted by SrI BhaTTar on thebasis of the mohini incarnation. He of mighty arms.om vIra-bAhave namah.SrI BhaTTar's anubhavam of this nAma is that bhagavAn has a thousand armswhich are all vying with each other in the wonderful act of churning theMilk-Ocean - arms which are shining with effulgent bracelets, armlets, andgarlands. SrI v.v. rAmAnujan gives reference to peria tirunozhi 5.7.4 -"Seyiru viSumbum ti~ngaLum SuDarum dEvarum tAmuDan tiSaippa Ayiram tOLAlalai kaDal kaDaindAn ara~nga mAnagar amarndAnE". We also have intiruvAimozhi - aSurarauit-tagarkkum tOLUm nAngu - 10.1.1.SrI Sa~nkara bhAshyam is that bhagavAn is vIra-bAhuh because he destroyedthe foes and established the moral law of the scriptures (veda-s).SrI rAdhAkRshNa Sastri observes that a vIra is one who engages in his actwith intensity in a prescribed way without backing down. BhagavAn's fourhands with four different weapons in them simultaneously go into actionindependently of each other, and accomplish the desired action flawlessly,each one of them displaying the quality of the vIra independently.The dharma cakram writer observes that a vIra is one who uses the might ofhis arms to help the cause of dharma and not for any selfish purpose.rAvaNa was also one of mighty arms, not just two but twenty of them for thatmatter. He cannot be considered a vIra, since all he could use his mightfor was to nurture his kAma. This nAma of mahA vishNu should remind us thatour abilities should be put to use to protect dharma, and not for selfishpurposes. a) He who cut (rAhu, hirNyakaSipu and others).b) He who cuts the sins of His devotees.om vidAraNAya namah.He who destroys (tears away) those who live contrary to dharma. He cut offrAhu with His divya Ayudha during the distribution of the nectar to thedeva-s in the presence of the asura-s. He is also known as vidAraNahbecause He cuts off the greatest of fears in His devotees - "samagra ugrabhaya vidAraNAya" is the mantra about bhagavAn. SrI v.v. rAmAnujan refersus to tiruvAimozhi 9.10.6 - Sem-ponAgattavuNan uDal kINDAvan - He who toreapart hiraNyakaSipu's body to help His devotee.The dharma cakram writer gives the interpretation that bhagavAn tears awaythe association (bandham) between the AtmA or the soul and the body orprakRti. BhagavAn is the one who separates or tears away the unchangingsoul from the ever-changing body.SrI satyadevo vAsishTha points out this guNa of separating - vidAraNa, inall aspects of His creation. Thus man and woman, day and night, uttarAyaNaand dakshINayana, pRthivI and antariksha, agni and soma, etc. are alldemonstrations or reminders of this guNa of mahAvishNu - vidAraNah. He isthe one who "tears away" or separates the child from the mother at the timeof birth so that the two live separately.